This spring in my inaugural “Digital Archives + Institutional Memory” studio we kicked off the semester by considering how institutional and organizational memories are constructed, and what methods and resources we could use to piece together The New School’s own institutional history. Then we examined an assortment of The New School’s founding documents, along with several pieces from newly acquired archival collections that document Media Studies’ formative years in the late 60s and early 70s. And to contextualize those documents we spoke with two of Media Studies’ founding faculty: Kit Laybourne and Peter Haratonik. Over the following weeks we worked closely with Wendy Scheir and Liza Harrell-Edge from The New School Archives, who proved to be incredibly generous and enthusiastic collaborators. We also visited and welcomed visitors from other institutions, who modeled both tried-and-true and highly innovative archival practices and tools. We went to the NYPL to talk about finding aids with archivist Thomas Lannon. We welcomed archivist Jenny Swadosh, who spoke with us about metadata; and Seth Kaufman and Julia Weist from Collective Access, who shared with us their inspiring work on the CA collection management platform. The following week, Ben Vershbow joined us from NYPL Labs; he spoke with us about the tools they developed to animate, and encourage public engagement with, the library’s archival collections. A few weeks later, we visited ArtStor — where we came to appreciate the physical, economic, legal, intellectual, and human infrastructure behind the digital archive. We then took stock of all that we’d learned from these fabulous guests in considering what modest contribution we could make to The New School’s archives. Our challenge, as stated on my course syllabus, was to “reimagine the ‘interface’ to the archives by prototyping…platforms for highlighting and recontextualizing noteworthy archival material – particularly material regarding the history of media study and media-making at The New School.” Students identified individual topics of interest for their own archival investigations and experimentation, but we committed to merging those interests in the production of a single, unified web project. Under the leadership of my fantastic TA, Angelica Vergel, we experimented with a bunch of platforms, practiced critiquing a bunch of other archival interfaces, then collectively decided that we’d use Scalar to create our own archival exhibition. We wanted to keep our potential users in mind as we worked on our exhibition, so we invited designer Jane Pirone to join us to discuss user experience testing. And we invited the multitalented Orit Halpern and Alex Kelly to serve as critics for a (pseudo-)mid-semester pecha kucha, where we shared our work in progress. In our first section, we map out The New School’s evolving institutional structure. This constant change reflects the institution’s drive to continually adapt in order to best support its mission. In the second section, three students explore the birth and growth of the Media Studies program, particularly how its course offerings and approaches to teaching and learning evolved in tandem with changes in the media landscape. Finally, in keeping with The New School’s commitment to creative critical practice, we propose our own experimental technological tools that might help us to engage the archive in new ways. 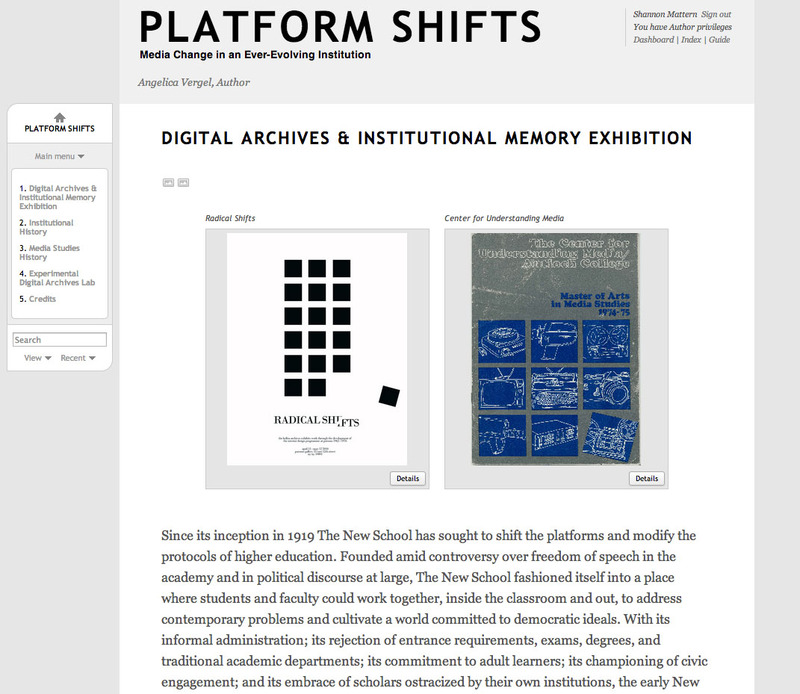 Thus the platform in which this exhibition is presented proposes its own shifts — planting seeds for the development of new media, new archival interfaces, and new approaches to archival study, that will continue to make even The New School’s archives ever new. This new pedagogical platform also embraced the arts as an integral component of social research. Media was taken seriously as a social force — and media making as a social practice. The New School has been a pioneer in both the study and making of media, offering among the first film studies classes in the 20s and integrating the country’s, if not the world’s, first media studies program in the 70s. The MA Program in Media Studies, born out of the Center for Understanding Media (founded in 1969), has always embraced contemporary theoretical frameworks and methodologies for studying media; and experimented with a variety of media technologies, from 16mm film to interactive technologies. This progressive media history is documented, in part, in The New School’s archives, particularly through recently acquired collections. This project reflects the work of graduate students in the Masters Program in Media Studies to trace these institutional, technological, pedagogical, and cultural platform shifts, and to place them into context. *quoted in Alvin Johnson, Deliver Us From Dogma, (New York: American Association for Adult Education, 1934): 39. I must reiterate my gratitude to Wendy Scheir and Liza Harrell-Edge from the New School Archives, my TA Extraordinaire Angelica Vergel, and our many talented and gracious guests and hosts — all of whom made this such an enlightening and rewarding experience for my students and me. Thanks to all of you!